A pool table surface is constructed of three separate pieces of slate rather than a single thin slab, because of the brittleness of large pieces of slate. The slate is then joined together with hot beeswax to produce a flat, seamless surface. Beeswax is used because it penetrates the seams and cools quickly to form a smooth, glue-like bond. Melting the beeswax requires the use of a double boiler to provide controlled heat. 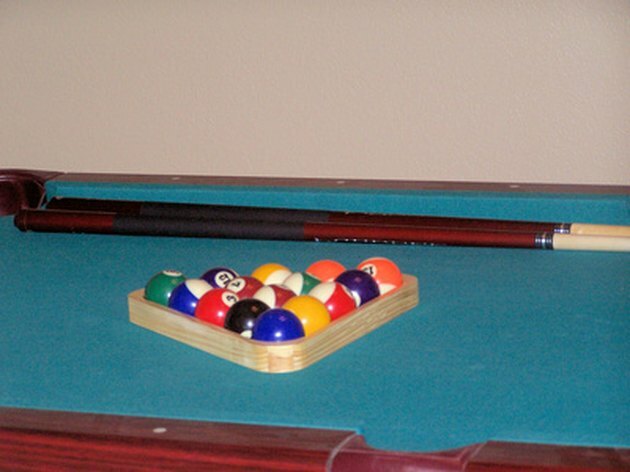 Beeswax creates a flat, even seam that cannot be felt on a pool table. Select a sauce pan that is large enough to hold the metal pour pot. The pot should be deep enough to accommodate at least three inches of water and the pour pot. Add three inches of water to the sauce pan and set it on a stove burner. Use tongs to place a metal cookie cutter or trivet at the bottom of the sauce pan. This will keep the pour pot from having direct contact with the bottom of the pan and overheating. Cut the beeswax into one-inch cubes or smaller for faster melting, and place in the pour pot. Place the pour pot in the simmering water. Watch the beeswax and remove from the heat once all the wax has melted. Stir the wax occasionally to distribute the heat evenly and speed the melting process. Pour the beeswax along the pool table seams quickly. If the wax begins to solidify before all seams have been filled, replace the pour pot in the simmering water and allow the beeswax to re-melt.